I have owned more camera bags than any photographer ever should. I buy one, use it for a while and usually enjoy them, but always end up finding greener pastures later on. But I seem to be sticking with the Mindshift Rotation 180 Horizon. I've owned mine for over a year now, and I've traveled over 15,000 miles with it on various trips. It's still my favorite camera bag. I first came across the Mindshift Gear Rotation 180 series of bags at a photography conference and was immediately taken with the clever rotation feature that allows the photographer to spin the lower portion of the bag around to the front for switching lenses, and then spin it back around to be part of the backpack again. In short, the Mindshift Gear Rotation 180 Horizon is my favorite camera bag of all time. It's crafted with an uncompromising choice of materials, and has a cleverly designed rotation feature to make switching lenses more convenient. I love being able to rotate the bag around to the front without even taking it off for a lens switch. But no camera bag is perfect. The bag really doesn't fit much gear unless you purchase a separate third-party insert that I found. But after you add in the insert, it'll fit tons of lenses, accessories, and gear. Also, for an extremely expensive backpack, I'll never understand why Mindshift refuses to include the rain cover. 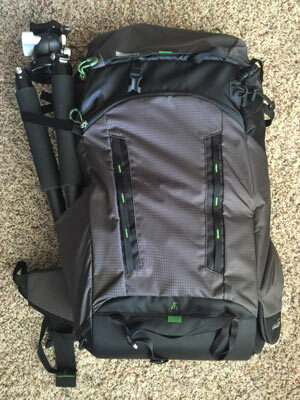 No camera bag is perfect, but the Mindshift Gear Rotation 180 is absolutely awesome! It's lightweight, built incredibly well, is super comfortable, and protects the gear well in even the most harsh photography environments. The Rotation 180 is my new camera bag of choice. The third-party insert I recommend makes a big difference in the bag. It fits WAY more gear and is easily removable for when you want the open pocket for clothes or a lunch on a day hike. The insert fits an additional 4 lenses, a speedlight, a transmitter, and a LAPTOP between the padded insert and the bag. Go read reviews of the Mindshift Gear Horizon and Panorama models all across the web and you'll find consistent feedback. “It's amazing, but it doesn't fit all my lenses.” The problem is that Mindshift put a well-designed camera compartment in the rotating waist belt, but left the entire top half of the bag as one giant pocket, which leaves your other lenses, filters, and other accessories banging around as you walk. I solved the problem! I searched around my camera bag graveyard (my closet of camera bags that I once loved but later ditched) and pulled out the insert from the Tenba small messenger bag (buy on Amazon). Guess what? It's an absolute perfect fit in the top compartment of the Mindshift Gear Rotation 180 Horizon! Mindshift Gear actually makes its own insert for the top compartment, but frankly I like the Tenba insert better than the one made for the bag. The Mindshift Gear insert is the same for the panorama (a much smaller bag) and the horizon. 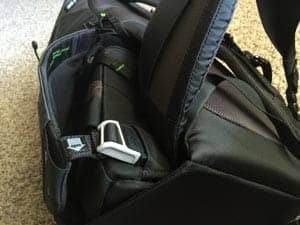 It doesn't fit as much gear as the Tenba insert, it doesn't create a laptop pocket like the Tenba insert, it doesn't have as much padding as the Tenba insert, and it has to be zipped open and closed every time. The Tenba keeps the gear from spilling around by having two flaps to the sides of the camera compartment. Oh, and it's cheaper too. The only negative is that it's slightly heavier than the Mindshift insert. Even better news is that you don't have to have your own camera bag graveyard to use this clever trick. You can buy the insert for a mere $25 right on Amazon.com. It's beautiful! The insert even somewhat matches the style of the bag (if you pick the gray version and not the blue) and looks like it's built in. I can't imagine why Mindshift doesn't offer something like this. 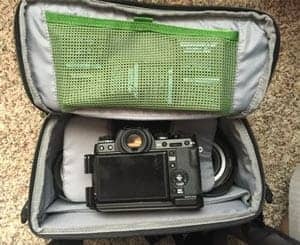 It completely reverses the only critique of this bag that I ever hear from other photographers. The other nice feature of buying that little insert is that it also makes a perfect compartment between the padded insert and the back of the bag for slipping in a laptop up to 13.3″ (34cm). It fits my 13″ Mac Air perfectly. The nice thing about getting this insert is that it's a piece of cake to put in and take out (about a 3 second operation, if you're slow as molasses). So if you're just going on a day hike and want to use the top compartment for a lunch, jacket, or a chihuahua, just take out the insert. If you're going with me to my amazing workshop in Guilin China to shoot the cormorant fishermen, then you can put in the insert and fit every lens you own, plus a laptop. This is the waist pack. The camera shown is a Fuji XT1, which is really about the same width as a DSLR. Weight of camera bags has become a huge concern for me recently. I travel the world holding completely free photography workshops with readers of Improve Photography. When you're spending lots of time in airports and hiking around foreign countries, it's not fun when your bag is too heavy. My previous bag, which is a worthy competitor to the Rotation 180 Pro, was the Clik Elite Contrejour 40 (watch my video review here). There was a lot to like about that bag, some of which this bag doesn't have. However, the bag alone was just a little too heavy by itself, and when it was filled up with gear it was unbearable. The Rotation Horizon weighs in at 3.9 pounds (1.8kg). I wouldn't mind it being another pound lighter, honestly, but compared to most bags of similar size, it does a decent job keeping the weight down while still being comfortable and having a reasonable amount of padding for the camera compartment. I like the size of the Horizon. It's just a little big for a day hike but still reasonable, and big enough to use for traveling with lots of gear and clothing. Although it's probably a tiny bit big for the exact dimensions of a carry-on, it's so close that I can't imagine you'd have any trouble cramming it in the little metal “Does my carryon fit” things that the annoying flight attendants make you check sometimes. I'm an average height for an American guy. I'm 5′ 10″ (180 cm), and the bag is plenty tall for me. On some camera backpacks I find the waist belt runs high across my stomach. I think the bag is tall enough for most people, yet not too small for women of an average frame size either. Very well sized for most, and the straps have plenty of play in them for adjusting to taller and much shorter people than I. This shot shows how the waist pack slides around to the front without taking off the bag. Rotation 180 PRO – The Mindshift Gear Pro model is the most popular among very serious photographers because of its size which fits larger bodies and lenses much better. If you're shooting a D4s or 1Dx or you use a battery grip or very large full-frame lenses, it's probably the better bet for you. The problem with the Pro model in my opinion is that it's just too heavy. With a total weight of 5.3 pounds (2.5 kilos), you're already starting off with a large heavy bag before you even put anything in it. Despite being only 4 liters larger than the Rotation 180 Horizon (38L on the Pro vs. 34 on the Horizon), it's 27% heavier than the Horizon. Some airlines will let you get away with carrying a Rotation 180 PRO as a carry-on, but if you ever get stuck on an American Airlines flight, you're hosed. Side note: The Rotation 180 Pro is also 38% uglier than the Horizon. Personal preference? Not a chance. It's a settled fact. Rotation 180 HORIZON – The bag I'm reviewing here. The Horizon is the goldilocks of the Mindshift Gear Rotation 180 series–not too heavy, not too small. It's juuuuuust right. The Horizon is the perfect mid-ground between the Panorama which barely fits any camera gear, and the Pro which is too big and heavy for my preference. 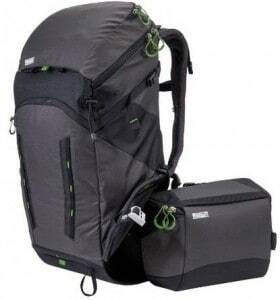 Rotation 180 PANORAMA – The Rotation 180 Panorama is a 22 liter day hike bag for those who manage with one or two lenses, very few accessories, and have smaller mirrorless bodies and lenses or crop sensor bodies and lenses. You can't fit very much gear in it at all, but it's lightweight and perfect for walking around with a minimal amount of gear. It has no dedicated laptop sleeve and there's no pocket big enough to cram in a laptop, although a smaller tablet would fit. Everyone I've talked to who owns the Panorama tells me the same thing, “I really love this bag. I just wish it fit my gear in it.” I would have to agree. Few serious shooters can fit their stuff in this bag. 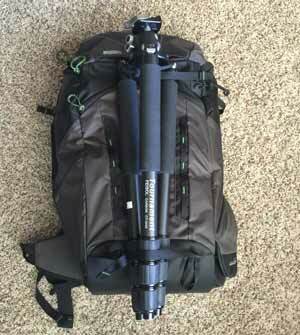 The tripod can be mounted on the side (shown), or down the center of the back of the bag. I personally put the following gear in the bag as my standard setup. I leave the bag completely packed and ready to go so I can take it with me any time I go out. Fuji 50-140mm lens (almost the exact same length as the Nikon 70-200 f/2.8 VR II). A 70-200 does not fit in the waist belt if you have the camera attached. Without the camera attached it might barely squeeze in. But if you get the insert I mentioned, it'll fit without any issues at all in the top compartment. I was skeptical about the rotation feature and what it would be like to use in real life, but I'm happy to report that it's just as awesome as you hoped it would be. It's easy to do even with one hand, it goes back in easily, and I use it several times on every shoot. My only complaint with the rotation feature is that the belt pack doesn't quite fit the 70-200 attached. I really with the belt pack were just a smidge deeper, which I would gladly take out of the huge top compartment. However, the beltpack does fit a big D810 or 5D Mark III with a 24-70mm attached and lens hood reversed. The ingenious magnetized “lock” on the side of the bag that you can reach back to and easily dis-latch to rotate the belt pack around. You can't knock the build quality of Mindshift Bags. Mindshift is a sister company of Think Tank, which is known for making very high quality bags. Every material is water resistant, durable, and will keep the bag looking new for years. My buddy Jeff Harmon says the zippers on his Think Tank bag are like butter. I'm not exactly sure what that means. I've never had even the slightest inkling to spread them on a piece of toast, but I like the zippers too. The bag has a nice sized pocket on the side for a hydration bladder (isn't it gross to call those a bladder?). I think it's a little weird that just about every company that makes adventure bags for photographers has a spot for a hydration bladder (snicker snicker), because despite having done dozens of workshops with photographers around the world, I have only once seen a photographer actually put a hydration bladder in a bag to use on a shoot. Yet, bags never have a convenient SD card pocket or filter holder pocket. And far too many bags don't have a laptop compartment (a deal-breaker as far as I'm concerned). It really burns me up that Mindshift cheaps out on photographers with the rain covers. It'll cost you an extra $25. When I'm paying nearly $300 for a backpack, I don't need to be nickel-and-dimed for every feature that should be built-in. All of the Clik Elite bags I used to use had rain covers sewn right into the bottom so they could never be lost, and they were included in the price of the bag. There is also a generous-sized open pocket on the other side for a water bottle, which I often use as a tripod holder instead, since there's a buckle right above it to strap in the top of the tripod. However, the tripod is meant to go centered on the bag right on the back. I like that the tripod can stay on and the pockets can still be accessed. Having two spots to put the tripod is a nice feature since I'm often carrying two tripods (one to take pictures with, and one for a video camera when I'm filming tutorials for our youtube channel), or a tripod and a small light stand. It looks like Mindshift must have MAP pricing, because this bag seems to be the same price everywhere. I bought it from the Mindshift Gear Rotation 180 Horizon listing on Amazon (click to see current price) because Amazon has free shipping, easy checkout, and easy returns. Oh, and I don't have to pay sales tax when I buy on Amazon.